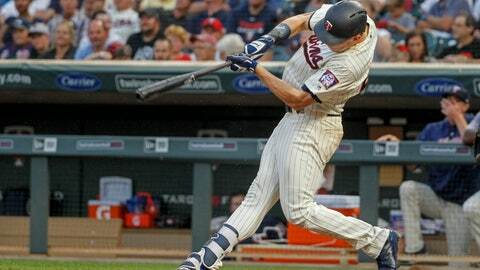 MINNEAPOLIS (AP) — Max Kepler saw a lot of pitches Friday night, and it paid off Saturday night. Kepler had three hits, including a two-run homer that put Minnesota ahead to stay, and Jose Berrios threw seven sharp innings to help the Twins to an 8-2 victory over the Kansas City Royals. Kepler went 3 for 3 with a walk and scored twice. He walked three times in Minnesota’s 6-4 victory in the series opener. Eddie Rosario and Logan Morrison also homered as the Twins won their second straight against the Royals. Berrios (11-8) retired his first six batters, but had trouble throwing strikes in his middle innings and allowed the Royals to take a 2-1 lead after walking the bases loaded in the third. The All-Star right-hander settled down and remained unbeaten against AL Central opponents this season. The Twins regained the lead on Kepler’s homer off Burch Smith (1-3) in the fourth. Rosario added a sacrifice fly in the fifth, and Logan Forsythe and Bobby Wilson each drove in a run in the sixth. “I still felt pretty good,” Smith said. “They just capitalized on mistakes. I didn’t make a pitch, and they hit it. It’s a good-hitting team. Morrison added his 15th homer in seventh, a towering two-run shot off Glenn Sparkman that traveled an estimated 442 feet before landing in the right-field concourse. Smith was charged with a season-high six runs in five-plus innings in his fifth start of the year. Manager Ned Yost still said Smith threw the ball well. “He started laboring in the sixth inning after about the 80-pitch mark, 85-pitch mark. Up until that point, I thought he did a good job of keeping us in the game and throwing strikes,” Yost said. Minnesota’s Addison Reed and Oliver Drake combined for two innings of scoreless relief. Drake, claimed off waivers from Toronto on Friday, set a major league record by pitching for his fifth team this season. He arrived at the ballpark on Saturday afternoon and said he appreciated the chance to get right to work. “I think my catch partner though the whole time has been a fence post back home, so it’s just nice to get back out there playing baseball, throwing to hitters, competing,” Drake said. Twins: Molitor said RHP Aaron Slegers (shoulder) would begin a rehab assignment with Triple-A Rochester on Saturday night. … RHP Michael Pineda is scheduled to begin his recovery from Tommy John surgery when he starts his rehab assignment with the Florida Gulf Coast on Monday. The Twins inducted former ace Johan Santana into the franchise’s hall of fame in a pregame ceremony. Santana, who won two AL Cy Young Awards during his eight seasons in Minnesota, became the 31st member of the Twins Hall of Fame. For five seasons, from 2003-07, he led the AL in wins (82), strikeouts (1,152), ERA (2.92) and opponent batting average (.212). Surrounded by family and former teammates, Santana was introduced by former teammate Torii Hunter before being presented with a Twins blazer by Rod Carew. “Go chase your dreams, work hard, be passionate about what you do. Have fun and never give up, and good things will happen to you,” Santana told the crowd. Royals: LHP Danny Duffy (7-9) will make his 24th start of the season Sunday. After posting a 6.88 ERA in his first 10 starts, he has a 3.00 ERA since May 24, the fourth-lowest in the AL in that stretch. Twins: RHP Ervin Santana (0-0) looks to return to his ace form when makes his third start since returning from the 60-day DL after being sidelined by an injured finger. He has allowed a combined eight earned runs in 10 1/3 innings with six strikeouts this season.